Compact polycarbonate (PC) is a transparent thermoplastic material that provides an optimal combination of unparalleled features: strength, transparency, lightness, flexibility, heat and flame resistance, a long life and safety. Versatile and highly workable, it is produced in sheets of various thicknesses. Given its excellent impact resistance, it is perfect for use in security windows and safety guards. Cellular polycarbonate is a specific type of PC, offered in double or triple-layer sheets that provide excellent thermal insulation and are noted for their light weight. Sheets can be both cut and cold bent and are suitable for external coverings. Compact polycarbonate is sold in sheets from 1 to 15 mm thick, in transparent, translucent and smoky, grey or brown versions. Highly workable, PC sheets can be cut, milled or bent to form panels or safety guards. LPT is the BayerTM distributor of the Piedmont and, for its Makrolon® brand, guarantees the use of high quality sheets that are created from the best raw materials. Compact polycarbonate sheets, thanks to their high transparency and the smoothness of their surfaces, are suitable for a wide variety of applications. They posses an extremely high impact strength, which is guaranteed to a temperature of 100 degrees. This impact resistance makes them optimal for use in high-risk areas such as security windows, cantilever-roof panels, unbreakable containers or safety guards. Cellular polycarbonate sheets, thanks to a low specific weight, are light and can be installed on simple supports. They possess elevated thermal insulation capabilities, are impact resistant and, thanks to a protective UV layer applied to their external surfaces, are highly weather resistant. Thanks to their extreme impact resistance, cellular polycarbonate sheets are particularly suitable for covering patios, winter gardens, greenhouses, barrel vaults and verandas. PC sheets are highly workable. In addition to customized cutting, LPT is equipped with hi-tech machinery such as CNC milling cutters that can produce extremely varied forms with exceptional precision. Hot or cold bending and gluing and finishing procedures enable the creation of guards and coverings. PC is the perfect solution for numerous applications required by designers, architects, companies and consumers: from prototyping to preproduction to serial products. Expert technical consultation is offered to customers for the requested product. 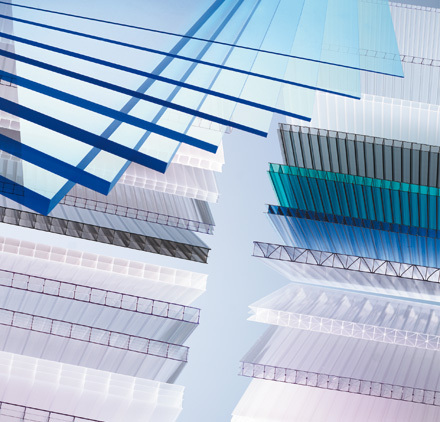 The exceptional impact resistance it favors engagement in risk areas, such as safety glass, panels for canopies, porches, railings or accident prevention guards, protection of equipment or machinery, unbreakable containers. It can be used for ceiling lights, advertising signs, luminous displays.